The mostly wet weekend dried into brilliant sunshine mid-afternoon. Off we went to Rithet's Bog, not far from our home. You'll notice the colour of the leaves and the blue skies above. But that's not all we saw. A grey squirrel chattered in a tree and paused long enough for a quick photo before scampering up and away. Through the darkest part of the trail where trees hide the light and the forest floor is cushioned with needles, then across the little bridge and onto a small quiet street where a few snapdragons glow brightly. Up a small rise and the view stretches beyond the bog to more houses and a cloud-scudded sky. A soft chic chic had me looking around until I spotted this Black-chinned hummingbird not too far away. He stayed still longer than usual and I was able to get a few photos. The Mallards are happy now that the bog is filling with rainwater. They paddle about, dive and bob up again, and come in a hurry if someone brings them seeds to eat. The loop is done and it's time to head home again, jackets unzipped, replete with sunshine, ready for whatever rain may come. No rain, not yet. It's so nice to have a couple of weeks of clear weather to be able to see the colors, see the sights and hear the sounds before precipitation sets in and takes over. Love your photos! That looks like a very nice walk. We got out to enjoy the sun this afternoon too. We had 3 days of rain this past week. So happy for the weekend sunshine. It was beautiful. Your walk looks lovely, and it's so nice to see the blue sky and leaves all golden. The squirrel, the hummingbird, mallard. This loop you walk sounds very pleasant with lots to see, including the wildlife. What a pleasant walk. The Autumn colours are looking lovely too. Beautiful post, Lorrie! I love the autumn colors and the bright blue sky and fluffy clouds. I think all our hummingbirds have migrated south--I have not see one in awhile! I would enjoy that walk Lorrie. How lovely to see a little squirrel, we don't have them here. Such vivid blue sky - a perfect Autumn day! 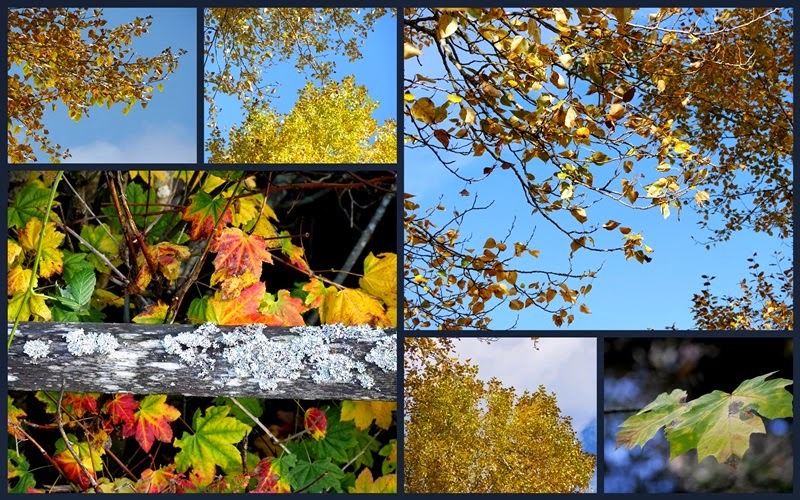 Beautiful photos, Lorrie, with skies so blue and autumn colours so brilliant! The birds and the squirrel are lovely. Lovely series, Lorrie! And a beautiful place for a walk, love the nature scenes. The leaves, flowers, squirrel and the cute hummer are all beautiful sights.. Thanks for sharing, enjoy your week! I always enjoy my walks with you. A beautiful walk and wonderful to see the hummingbird and the duck. The fall colours are gorgeous against the blue sky. I'm glad you got a reprieve from the rainy and grey days. These are all beautiful, Lorrie! I like that squirrel photo best of all. Isn't fall glorious! Charming photos. We too were surprised by the sunshine in the afternoon - it was lovely and refreshing. I suppose tomorrow we are back to rain - we have a high wind warning for tonight so another storm must be moving in. That's ok - makes things all clean and sparkly when we do get sunshine. I have a morning walk much like this only I can't seem to get a deceit photo to share. Southern California is desperate for rain. It seems they are drilling deeper wells for water, but because of fracking it is coming up toxic. Pray for rain please. We had crazy, torrential rain in Vancouver Saturday night -- but then all kinds of gorgeousness on Sunday! Today, in Nanaimo, the skies are foreboding . . . batten the hatches! Enjoyed all the pictures - pretty Fall colors. Thanks for sharing your walk with us. It has been beautiful here the last several days, but rain predicted for tomorrow and much cooler temps for a while. Good for you to fit that walk in. Great photos. You still have some fall color to enjoy. Yes, we started getting some sunshine yesterday too, but I don't think our skies were quite so blue or the colors quite so brilliant. You have some beautiful colors in this post. Today was amazing and we were able to have lunch outdoors. That doesn't usually happen so close to November. Lots of rain here off and on plus a big windstorm this past Saturday. Loved your photos--especially the hummingbird, squirrel and duck! What kind of seeds do you feed them? What a nice and peaceful walk!! It has been quite beautiful here in Virginia. The weather is changing, though. It's going to be rainy and cold for at least the next few days. This change in the weather will probably make the leaves turn quickly.